The advantage of the cold spring has been a much longer display of daffodils and primroses. The brief spell of warmth in mid April has finally brought tulips into flower. There were very few ready for the show on 7th April. 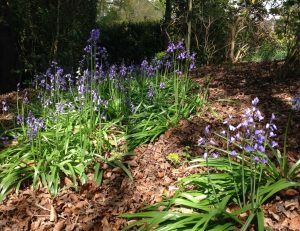 BUT May is the month for bluebells, azaleas, apple blossom and all sorts of floral bounty. * Earth up potatoes when the foliage reaches 23cm/9in to prevent green tubers or, if frost is expected, cover smaller sprouts with soil for protection. * Sow carrots, radishes, beetroot, lettuce and spring onions for successional harvesting. * Direct sow French beans and sweet corn. * Mulch strawberry plants with straw to keep the fruit clean, and feed fortnightly with tomato feed. * Prune overgrown Camellia to young side shoots which will flower next year. 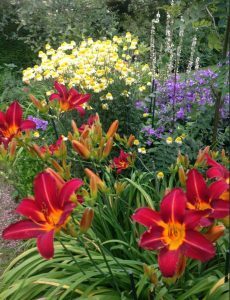 * Dead head spring bulbs but LEAVE THE LEAVES to feed the bulbs until they die back. If daffodils did not flower well, lift and divide the clumps. * Take soft wood cuttings of Fuchsia, Anthemis, pelargonium and verbena. * At the end of May, do the ‘Chelsea chop’ on late flowering herbaceous plants like sedum (Hylotelephium) that tend to flop outwards. The flowers may be later but they will be sturdier. 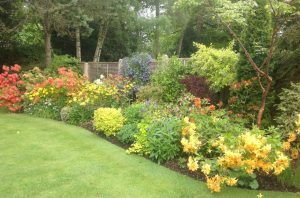 ‘Selborne’, Caker Lane, East Worldham and East Worldham Manor open on 19th & 20th. 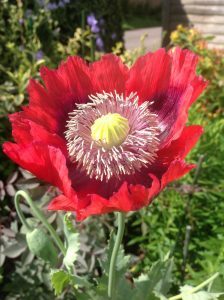 Refer to www.ngs.org.uk for details and other gardens open for charity.